Our clie nt Emperor’s Palace, wanted us to capture a variety of action-packed cycling shots for its Cycle Classic held in the vicinity of the resort to send to various media. The aim was to move away from the routine shots at the start and end, by shooting exciting images in different scenic points along the entire race route. Peter’s dilemma was how to get good angles all along the route. 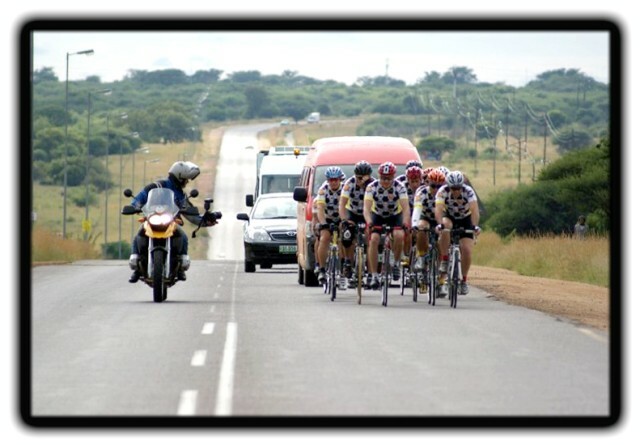 Even driving in a vehicle, it’s difficult to take pictures of the cyclists, and then overtake them safely to get to the next vantage point. As a proficient motorcyclist, Peter came up with the concept of travelling on his motorbike next to the cyclists holding his camera in one hand while riding with the other. This bold approach enabled him to take innovative close up pictures from different angles and positions throughout the race. 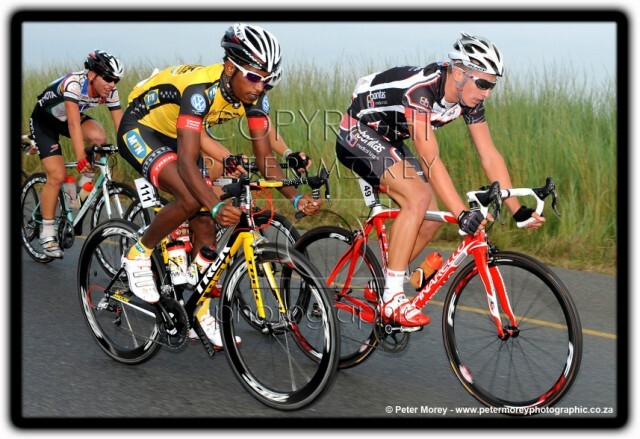 Never to be outdone in any situation, Peter rose to the challenge for his client, capturing a series of riveting action shots of cyclists along the route without distracting them or endangering his own safety. To transform a routine cheque handover into an eye catching image to maximise our client’s media exposure. 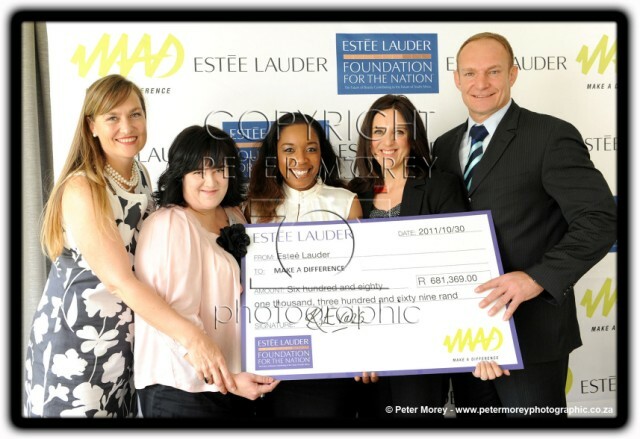 This event involved various Estee Lauder fundraisers who had raised money for ex springbok rugby captain Francois Pienaars (MAD )Make A Difference campaign"
We wanted to capture an exciting picture to liven up the event and recognise several staff members involved in the fundraising. We devised a picture to incorporate a fun rugby angle that still conveyed the message of our client as a caring organisation. Peter Morey discussed his ideas with Francois Pienaar and Estee Lauder beforehand, an approach he has found works well with celebrities in a relaxed atmosphere. 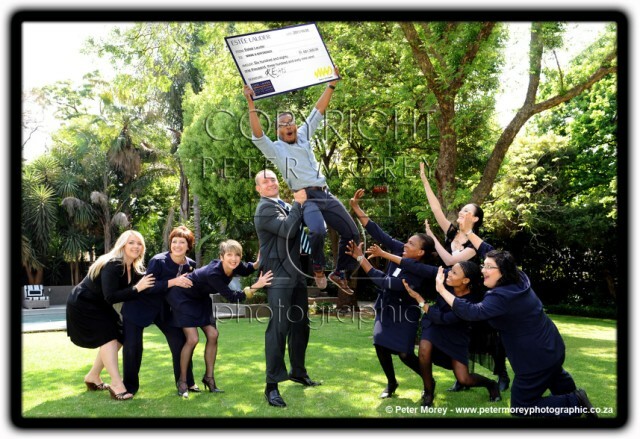 By getting the thumbs up from Francois and Estee Lauder and taking time to plan the picture beforehand, Peter managed to portray a lighthearted moment in a well composed image depicting one of the fundraising representatives leaping up in rugby-style up to grab the cheque. When you’re looking for a photographer, it helps to know what to look for to ensure you are not disappointed. Here are my five top tips. 1. Ask the photographer to show you some samples of his or her work – talk is cheap; the proof is in the photograph! 2. Do not underestimate the value of good references. Ask the photographer for contact details of previous clients – ask how the photographer handled the job, the level of professionalism, if he or she arrived at the shoot on time and whether the final product met the client’s expectations. 3. Don’t be afraid to ask questions – for example, ask the photographer to explain certain pictures and the reasons for shooting it in a particular way, what settings were used and why. Real professionals should have a thorough knowledge of their equipment and be able to handle anything that happens during a shoot. 4. 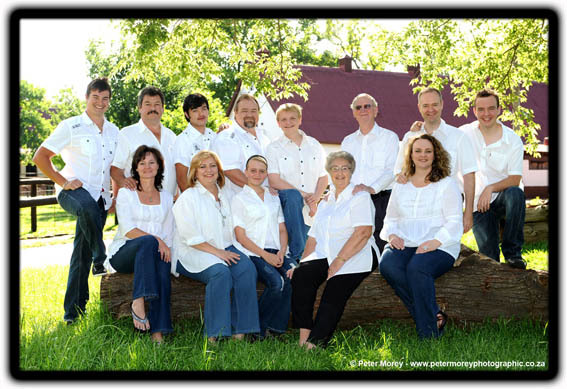 Check whether the photographer will edit your images or whether they’ll simply be cut onto a CD. You’re likely to pay more if unedited pictures need tweaking later. 5. Lastly, never merely settle for a photographer that offers the cheapest rates. 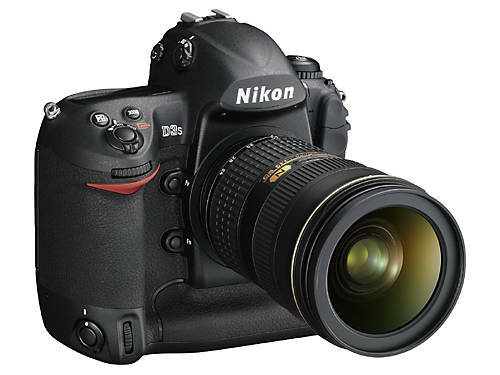 It takes more than a fancy digital camera to be a great photographer! Rather look for an experienced professional that offers the best overall deal for your specific needs. 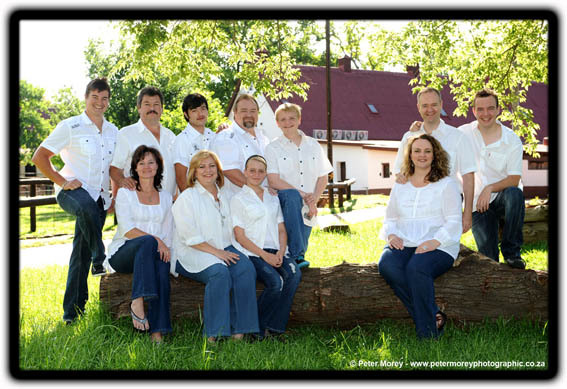 To take a family photo for Oupa and Ouma du Preez with all their children and grandchildren. The difficulty was that not everyone was available at the same time for the shoot. More importantly, having everyone in the same photo was a surprise for the unsuspecting old couple. On Day 1, Peter Morey photographed the entire family except for Oupa and Ouma at a scenic outdoor location, leaving space in the picture to 'drop in' the grandparents. 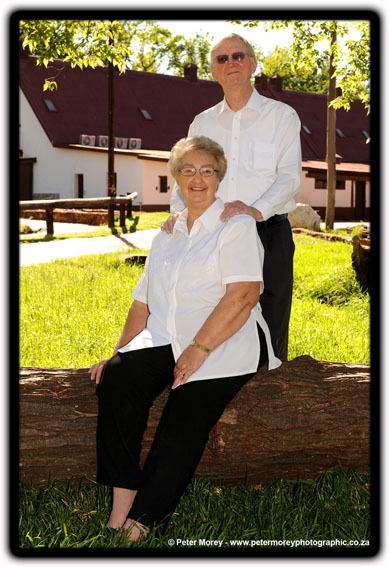 The next day, under false pretences, Peter photographed Oupa and Ouma at the same venue, ostensibly for a 'wedding anniversary photo.' We then photoshopped both pictures to appear as if the whole family had been photographed together - the wonders of digital technology!